I suscribe to the Bon Appétit Daily Recipe online newsletter and thoroughly enjoy it! It provides great recipes, feature articles and links that are both educational and fun! Earlier this week, there was an article on “Six Common Mistakes to Avoid with Dried Beans.” At the end of the article was a link to 25 great bean recipes. Yes, there are more than pintos and green beans out there. I’m a big fan of cannellini (white kidney) beans and serve them frequently. I printed out several white bean recipes from the selection and will be sharing them with you if they are as good as they read. Last night, I made what was billed as a side dish of White Beans with Broccoli Rabe and Lemons. The bold flavors of broccoli rabe and lemon and the smooth taste and texture of cannellini beans were a good match. Garlic and anchovy fillets contributed to a wonderful saucy broth that underscored the other flavors of the dish. Don’t be afraid of of anchovies. When cooked in a liquid, they literally melt and add a savory subtleness to a complex dish. That savor is umami. The word is borrowed from the Japanese. Umami is considered one of five basic tastes we experience including sweet, sour, bitter and salty. Umami’s savory taste can be developed from preparations of seafood and meat products. I’ve yet to find a jar of umami on a grocer’s shelf, but I’ve learned to enjoy the taste sensation from cooking anchovies, adding Asian fish sauce to a recipe, and from poultry, beef and fish stocks and broths. The umami in this recipe came from two anchovy fillets. The taste was neither fishy nor salty. It was a savory subtleness which complimented and “made” the recipe the as the ingredients’ flavors melded. I can only say it was a Umani Bomb for me that I’ll be making again very soon. I do still have some broccoli rabe in the fridge. I served this dish as a side with pan roasted skinless, boneless chicken thighs accented with a dry rub. After tasting the beans and broccoli rabe I decided it was the feature and the chicken was the side for this meal. Don’t get me wrong, the chicken and beans were very good together, but the bean recipe was the Bomb! White Beans with Broccoli Rabe and Lemon. Anchovies in the sauce made it a Umami Bomb! It was so good that the chicken became the side dish in my mind. Heat oil in a large dutch oven or heavy pot over medium heat. Add lemon slices, anchovies and garlic. Cook, stirring occasionally, until lemon is softened and brown in spots and anchovies fall apart, about five minutes. Add broccoli rabe, season with salt and pepper and cook, tossing occasionally, until bright green and crisp-tender. Add beans and 1/2 cup water to pot. Bring to a boil; reduce heat and simmer until flavors have melded and liquid is reduced by half. You want it to still be saucy. Mix in parsley and the 2 Tbsp Parmesan. Transfer to a platter. Sprinkle with red pepper flakes, if desired, and top with more Parmesan. * I prefer to buy anchovies in a resealable jar over in a tin. It is easier to store the jarred ones in the fridge and they last a long, long time. Just remember to set them out before cooking so the oil can warm up and become liquid again. It’s been a while since I’ve posted. Things do get hectic now and then, but somehow finally settle down – looks out, I’m back! Months ago, I did a cactus cooking demonstration at the El Paso Museum of Archeology. A couple in the audience are involved with an exciting gardening project at Bowie High School. Bowie is located a stone’s throw from the US/Mexico border. It’s students are largely economically disadvantaged, but they work hard and the school has had many success stories among its alumni. The Bowie Bears spirit legendary and it lasts a lifetime in its alumni. The couple who attended my demo talked it up, and I was invited to do a demo for a nutrition class earlier this week. It turned out that I did the demo three times for multiple classes. I do an introduction to cactus and its nutritional benefits and frequently share a little ethnobotanical story about the three sisters – beans squash and corn and what happens when they meet the guys from down the block – cactus, onion, garlic, tomato and chile. Then I demonstrate how I cook prickly pear and dissipate the mucilaginous secretion from the cactus. It is similar to the sticky slime of boiled okra. I offer the audience a chance to taste both raw cactus and my cooked version. Then, I offer them a taste of something I have made in advance. The Bowie students got to try a new original recipe – Cactus and Chile con Queso bites. I do it in mini-muffin cups which are just right for a bite size taste. I made 10 dozen for the Bowie project and had just a few left over at the end of the day. 10 dozen Cactus and Chili con Queso Bites prepared for a demo at Bowie High School. Fortunately, I have two mini-muffin pans that hold two dozen muffins each and speed up cooking for both these tasty treats and the mini cheesecakes I make for some demos. I enjoyed the experience with the Bowie students. They were interested, attentive and very polite. Two teachers helped with serving and my powerpoint show. It was so much fun for me that I accepted an encore performance for the four morning nutrition classes in March. Cool the bites on a rack so they don’t “sweat” in the muffin pan. Chop cleaned nopales into ½ inch dice, sauté in oil until sticky secretion has evaporated and nopales are olive green in color. Let cool and chop finely. (Adding one Tbsp of water at a time to the pan creates steam that cooks and helps evaporate the sticky off quicker. Lightly oil a skillet and sauté tomato, green onion and garlic. Set aside to cool slightly. In a medium bowl, beat the four eggs and add the cheese, green chile and nopales. Stir in tomato mixture and spices and stir well to incorporate into an even batter. Line mini-muffin tins with paper liners. Spoon 1 scant Tbsp batter into each cup. Bake for 10-13 minutes or until centers are set. Let cool in pans for a few minutes and carefully remove from pans. 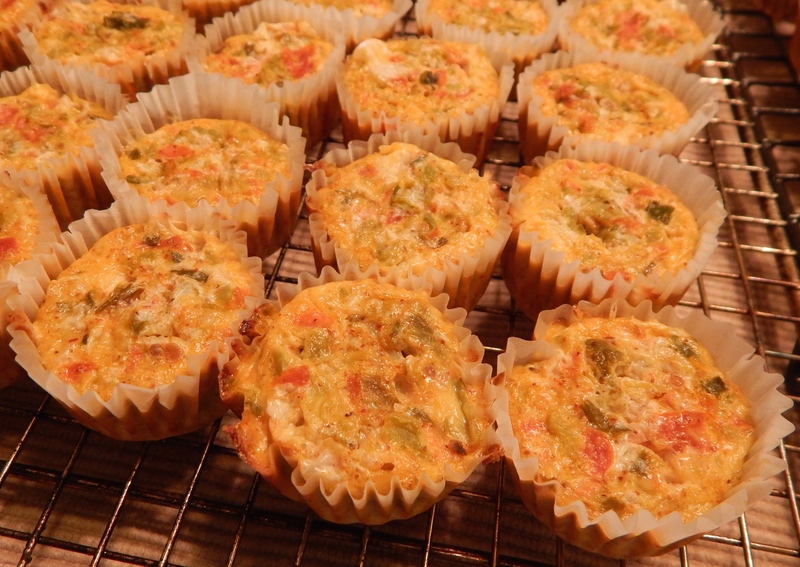 Option: Bake bites topped with a jalapeno slice and serve warm or at room temperature. * I do a coarse chop of the vegetables with my chef’s knife, then toss them into my electric mini-chopper and pulse them to chop into small its. The bites are small and you want a very fine chop on your vegetables. The machine is a great time saver and pulsing lets you control the texture. Yields 24 bite sized servings. While whipping up something tricky and new is a lot of fun, you can’t beat a simple supper, now and then. Baked salmon with a generous sprinkle of Tajin, a Mexican chile and lime powder that is good on everything from soup to nuts! A salad of arugula and baby spinach dressed lightly with a pomegranate vinaigrette and topped with slices of blood orange and navel orange as a sharp and acid compliment to the rich fish. Young artichoke steamed over water with lemon juice and served with a lemon and garlic aioli. I made the aioli the lazy man’s way – good mayonnaise, grated lemon zest, grated garlic and lemon juice. A sauvignon blanc enhanced the simple supper. Is cauliflower this year’s darling veggie? I’ve been seeing lots of new cauliflower recipes this year. I’ve always enjoyed cauliflower. Growing up, it was boiled to death and hidden in a gooey cheese sauce. More recently, it’s been roasted as a breaded whole head or broken into florets and combined with other vegetables. I also like to puree cooked cauliflower and add a bit of butter, salt, pepper and Greek yogurt to make “fauxtatoes” as a low carb alternate to mashed potatoes. And now, I’ve found a recipe for using it raw – and I don’t mean florets dipped in ranch dressing as a crudite. It becomes a replacement for couscous in a tabbouleh which is nice for grain or gluten-free dieters. What I like about this recipe is that I get two treats from one head of cauliflower. I started out wanting cauliflower “steaks” as a side dish. I bought a small head and sliced two one inch steaks from the center. I was left with the side pieces. My recipe was for four servings which would have meant two heads of cauliflower and lots of side pieces, so I reduced the recipe ingredients by 1/2 for two servings. The recipe below is for the full four servings because I’m a guesstimator and taster when reducing or expanding ingredients. I also found a new grilling salt with salt, red pepper flakes and ground fennel seed I wanted to try on country style pork ribs. 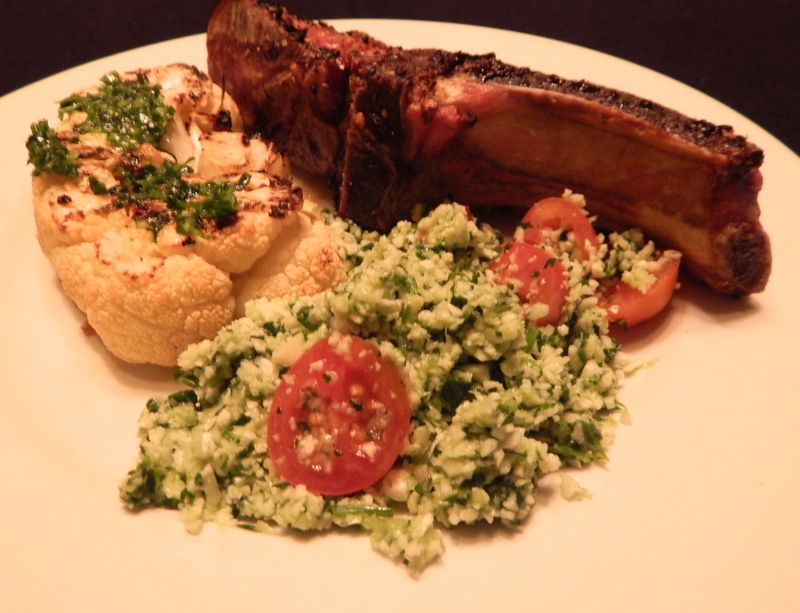 If you happen to be vegetarian, the cauliflower steaks and tabbouleh are a great meal on their own. Cauliflower tabouleh with a cauliflower steak and country style pork rib. Cut two one inch thick “steaks” from the center of each cauliflower. Trim stem and leaves, leaving just enough stem to keep the steaks intact. Set aside. Trim remaining cauliflower and break into florets; place in food processor. Pulse in processor until about the size of grains of rice. Transfer to a large bowl with the tomatoes and red onion. Since the food processor and fill with parsley, green onion, 4 Tbsp of the olive oil, the lemon juice and 1-1/2 tsp salt and 1/4 tsp pepper. Process until the mixture is the texture of pesto. Transfer two tsp of the herb mixture to a small bow and set aside. Stir the remaining herb mixture into the cauliflower, tomato and red onion. Brush both sides of the cauliflower steaks with olive oil, season with salt and pepper and cook on a heated grill or grill pan. Cook, turning once, until the cauliflower has good grill marks and is tender – roughly 10 minutes per side, reduce the temperature if necessary so they won’t burn. Poke a solid part of the cauliflower with a paring knife. It is done when you can pierce it through. (I grilled my “steaks” on the grill with my ribs. The cauliflower steaks actually took a little longer than the ribs. I also used a bottled vinaigrette dressing to baste the steaks just before removing them from the grill.) Arrange the steaks on a plate and drizzle with the reserved herb oil. Serve the tabbouleh on the side. Keep the band around the stems of flat leaf parsley, rinse and shake as dry as you can. Place the bund of parsley on a cutting board, hold the stems and with a knife blade held horizontally, shave the leaves off the stems. If you pull some thick stems from the bunch, pick them out – they can be bitter. Remove the leaves and tender stems and add to the shaved leaves. Chop as you would a mound of individually picked leaves.